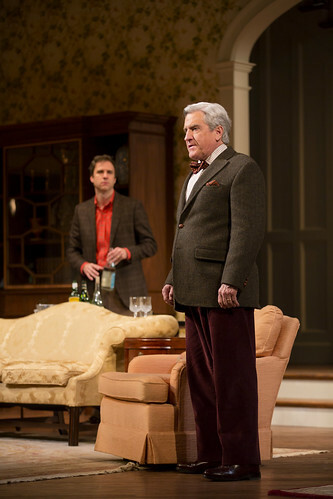 The pre-dinner cocktail is a revered ritual in John's parents' elegant home, but when he returns to announce that he has written a play about them, their calm demeanor dissolves. As the martinis flow, so do the revelations and recriminations, both funny and poignant, in this heartfelt comedy about the ties that bind. Approximate run time: 2 hours, including one ten-minute intermission. 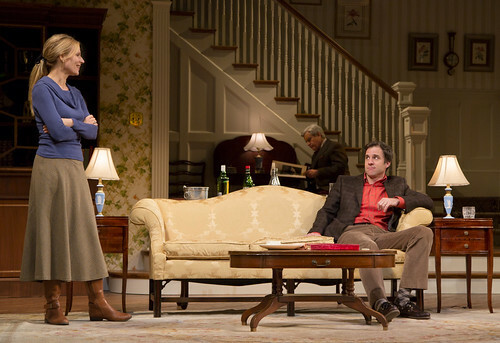 Huntington favorite Maria Aitken returns to the Huntington to direct A.R. Gurney's The Cocktail Hour. 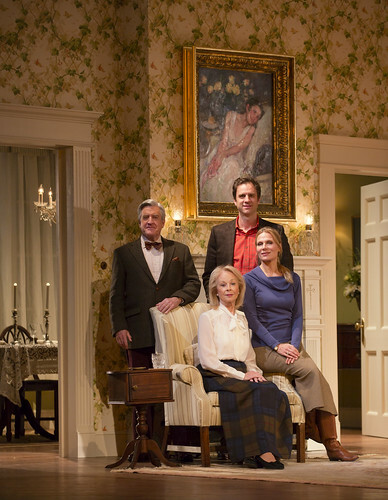 Go behind the scenes of this American comedy of manners with Maria and cast members James Waterston, Richard Poe, Maureen Anderman, and Pamela J. Gray. 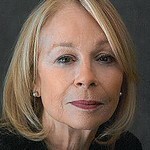 In a 2009 interview with the New York State Writers Institute, playwright A.R. Gurney discusses setting his plays in a single location. Artistic Director Peter DuBois discusses A.R. Gurney's The Cocktail Hour, and explains why frequent Huntington collaborator Maria Aitken is the perfect choice to direct this American comedy of manners. 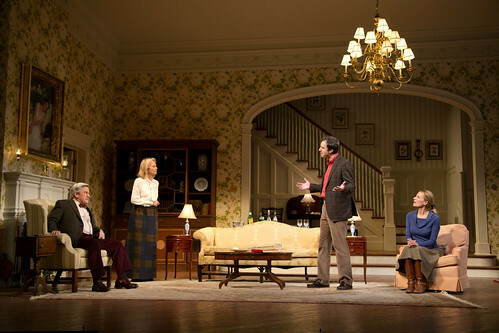 Scenic Designer Allen Moyer takes you behind the scenes of the WASP-y Buffalo home of John's parents in The Cocktail Hour, and shares his inspiration and designs for the set along with process shots from the Huntington Scene Shop. Hear what audiences are saying about A.R. Gurney's comedy-on-the-rocks The Cocktail Hour, and get a sneak peek at scenes from the production directed by Huntington favorite Maria Aitken. On Sunday, December 1, The Cocktail Hour playwright A.R. Gurney spoke with Bob Oakes (WBUR’s “Morning Edition”) about his long and continuing career, his body of work, and his relationship to this autobiographical play. From Los Angeles Times, May 9, 1991: Playwright A.R. Gurney has endured sharp criticism for focusing on the culture of his youth, but his latest effort, The Snow Ball, comes as he is earning long-awaited acclaim. The Cocktail Hour is doubly autobiographical — a play about a frustrated publisher named John who returns home brandishing a play he has written about his family to confront their resistance to being dramatized. John is clearly fashioned in the image of Gurney himself, and his upper-class clan bears more than a passing resemblance to the playwright’s own. While the prep- schooled scions of the old-money elite controlled America’s political, business, and military establishment for decades, they remained chronically underrepresented in the arts — and happy to remain that way. However, as their influence slipped away in the later decades of the 20th century, it fell to the outcast artists among them to counter — or embrace — the stereotypes that had come to define the “WASP.” The family that A.R. Gurney conjures in The Cocktail Hour exemplifies the paradox of this situation. The martini is the beverage par excellence of America’s much-dwindled leisure class. Eschewing flashy colors and overpowering mixers, it relies instead on a refined balance amongst a few ingredients: ice, dry vermouth, a twist of lemon or an odd number of olives, and gin. It is an acquired taste, unapologetically strong, and rooted in tradition. Albert Ramsdell Gurney, Jr. grew up “surrounded by plays” — at school, on the radio, at the charity performances of his parents’ social clubs, on weekend trips to local theatres and Broadway. While his upper class milieu hardly considered dramatic writing an exemplary career, it was in many ways the natural trajectory for a man who had been immersed in the theatre since childhood. From BU Today, Nov. 20, 2013: "The bite, poignancy, and universal themes of The Cocktail Hour resonate as powerfully today as when it premiered Off-Broadway 25 years ago. 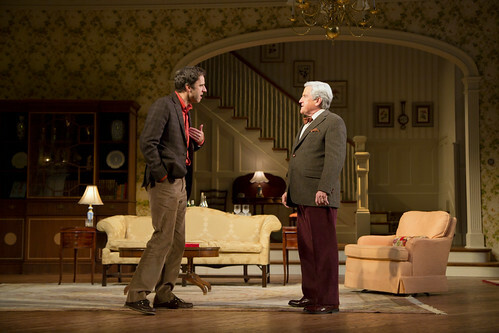 The A. R. Gurney comedy of manners is set deep in a gilded New England WASP culture that on its surface seems even more rarified than it did then. . . . "
From The Boston Globe, Nov. 14, 2013: "A.R. Gurney’s The Cocktail Hour is about a playwright whose parents are unhappy that he’s written a play about them. Want to guess what Gurney’s mother said to him after she saw it in New York? . 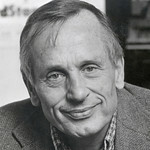 . . "
Albert Ramsdell Gurney, Jr. is an American playwright and novelist. His works The Dining Room (1982); The Snow Ball (1991); and The Cocktail Hour (2013) have been previously produced at the Huntington. 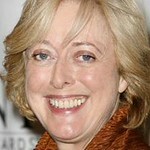 Maria Aitken has credits that include the Olivier and Tony Award-winning production of Alfred Hitchcock's The 39 Steps (2007) which she directed at the Huntington Theatre Company as its American premiere before its Broadway and Off Broadway runs. 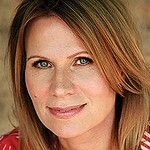 Ms. Aitken also directed Sherlock's Last Case (2018), Bedroom Farce (2016), The Seagull (2014), The Cocktail Hour (2013), Betrayal (2012), Private Lives (2012), and Educating Rita (2011) at the Huntington. 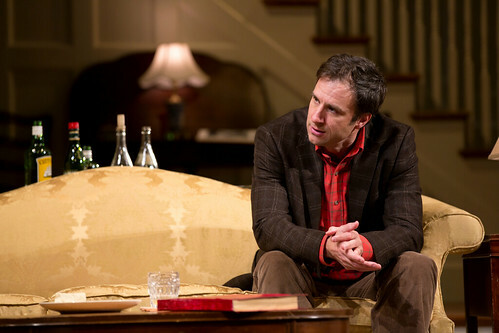 Richard Poe previously appeared as Bradley in The Cocktail Hour (2013) and as Christopher Sly in The Taming of the Shrew (1983) at the Huntington. He has appeared in 14 Broadway shows, including M. Butterfly, The Pajama Game, Journeys End, Our Country’s Good, Cry-Baby, Moon Over Buffalo, and Fiddler on the Roof. 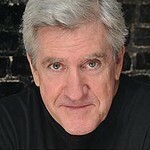 James Waterston previously appeard in The Cocktail Hour (2013), Private Lives(2012), Gross Indecency: The Three Trials of Oscar Wilde (1998), and Ah, Wilderness! (1998) at the Huntington. 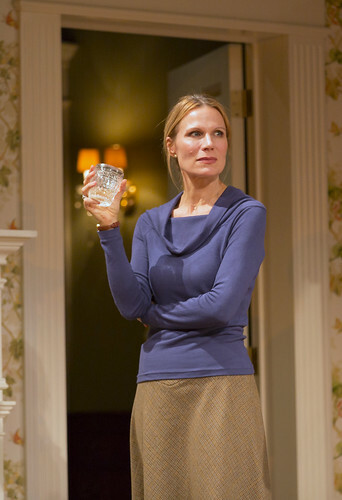 Maureen Anderman appeared in The Cocktail Hour (2013), Becky Shaw (2010), Third (2008), Rabbit Hole (2006), and The Sisters Rosensweig (2005) at the Huntington. 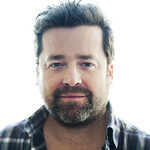 Allen Moyer previously designed the set for The Cocktail Hour (2013), Betrayal (2012), Private Lives (2012), Before I Leave You (2011), Educating Rita (2011), and Pterodactyls(1994) at the Huntington. 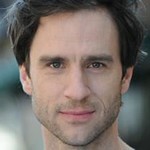 His Broadway credits include The Lyons, Lysistrata Jones, After Miss Julie, Grey Gardens (Tony and Drama Desk Award nominations, Henry Hewes Award), Thurgood, The Little Dog Laughed, and The Constant Wife. Mr. Moyer is the recipient of the 2006 Obie Award for Sustained Excellence. 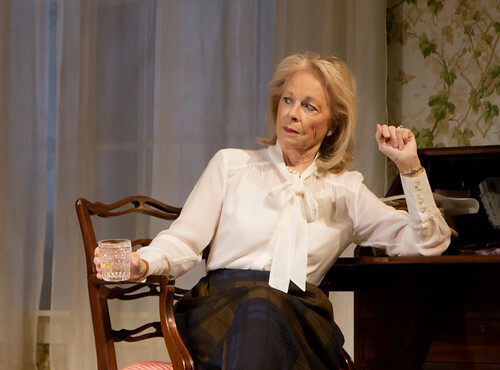 Candice Donnelly previously designed costumes for The Cocktail Hour (2013), Private Lives (2012), and Burn This (2004) at the Huntington. She has Broadway credits that include Our Country’s Good, Fences, Hughie, Search and Destroy, and Mastergate. Additionally, she has designed shows for Hong Kong Opera, Minnesota Opera, Flemish National Opera, Berkeley Repertory Theatre, and the Williamstown Theatre Festival. Paul Palazzo previously designed lighting for the Huntington's production of The Cocktail Hour (2013). 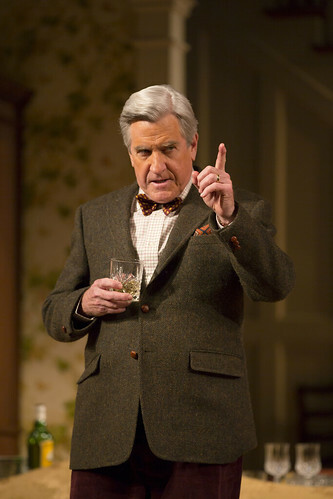 Mr. Palazzo has Broadway credits that include Twelve Angry Men at the American Airlines Theatre (Roundabout Theatre Company).